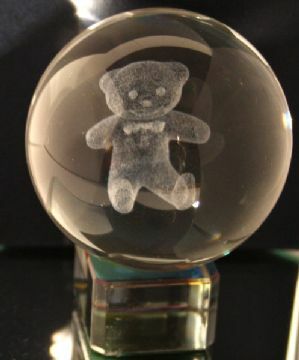 This is a laser engraved crystal ball with an intricate design of a cute teddy bear in the centre. This is a 50 mm diameter crystal ball which comes with it's own velveteen based crystal stand. The stand has been AB treated to cast magical and beautiful colours. Packed in it's own presentation box. Makes an unusual gift that will look great in a light catching position.